← Do You Have A Devilish Soundtrack For Your Launch Party? The Party is coming! The Party is coming! I’m so into the fun of party planning that I decided the More Cowbell Mash-up of Launch Party links could wait until tomorrow. In case you’re asking, What Launch Party?…. 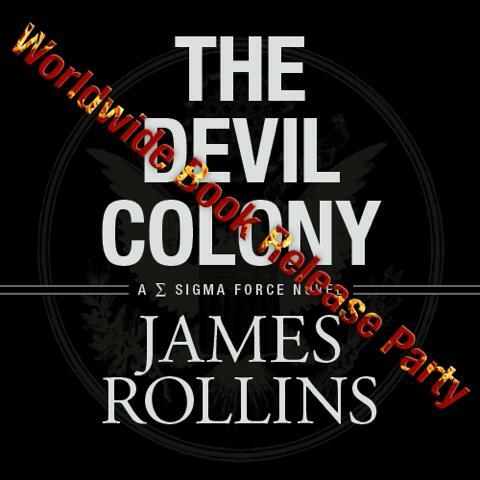 The Worldwide Book Release Party for James Rollins’ new book, The Devil Colony, is starting in less than 24 hours at #DevilColony on Twitter. The Devil’s Tomb (2009) – Cuba Gooding, Jr.
What about you? Any fa-a-a-avorite movies on board this week? Any must-visit Book Launch hot spots I need to include in tomorrow’s mash-up? Have you started taking pictures already? See you tomorrow with a FULL summary of party places for the HUGE event on #DevilColony! This entry was posted in Amazing Writers, Book Reviews, Miscellaneous and tagged #DevilColony, Al Pacino, book launch, Devil in a Blue Dress, Fan of Man speech, favorite movies, James Rollins, Jenny Hansen, Jenny Hansen's Blog, Kristen Lamb, More Cowbell, More Cowbell mash-up, movies, movies with devil, party on the playground, party planning, She-Devil, The Devil Colony, The Devil Wears Prada, The Devil's Advocate, The Devil's Playground, Twitter, Worldwide Book Launch Party, Worldwide Book Party Launch. Bookmark the permalink. Jack Nicholson certainly LOOKED like the Devil in The Shining! A couple of my favorites is Rosemary’s Baby and The Witches of Eastwick. Ooh, the Devil’s Advocate was good and creepy!! Devil wears Prada is probably my favorite off your list. My girlfriend, who is MAD for shoes, almost wet her pants in the theater when they showed those racks and racks of shoes. I’ll never forget that scene because of it. Literally, she had to hold herself back from leaping toward the screen. It was hilarious. I LOVE that you’re getting your devil on. The Devil Wears Prada. 🙂 Not a horror fan because they give me nightmares. I just watched the movie, Devil….where everyone gets stuck in the elevator with the Devil and die one by one….yea, it’s not that great; but, I kept watching! Oh my God, I just can’t watch stuff like that? Seriously, the Freddie Krueger movies almost scared me to death. The one where his arm got all those suckers on them? *shudders* Gruesome!